Paul Barchilon Ceramics :: Hex Out! The title is short for Hexagon Outline. I originally called this pattern Hexagon Tessellations because it was designed to tessellate (fill an area with interlocking repeating units) around a hexagonal grid. The Outline in the title refers to the gold illumination. This has been one of my most fertile designs ever. I drew it in ink on paper and then scanned the lines into the computer. This was the first pattern I tried this with and the results were fantastic. I found that by altering lines in the repeat unit I could quickly play out different tile patterns in Photoshop. To date I have developed two different vase patterns, three platters and several tile schemes from this one design. To draw each of those ideas out by hand would have taken around ten hours apiece, I was able to do each in half an hour on the computer. This was the pattern that sold me on the merits of using the computer as a design tool. I later noticed that the central motif, the Star of David, was surrounded by six smaller Solomon's Seals. King Solomon was actually King David's son, so I also call this pattern Two Kings. A version of this design is available as a repeating tile pattern and it looks incredible when it fills an area. Visit the Tiles and Coasters link to see a sample. 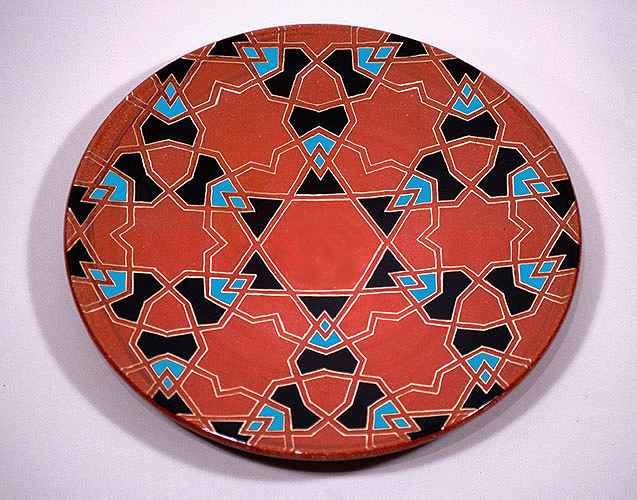 This pattern is also available as a Seder Plate with matching little plates illuminated in Hebrew. Click here to visit my other Seder plates. All of my platters are around 16" in diameter and are wired through the foot on the reverse to be hung on the wall. Any of my patterns can be commissioned in any of my color schemes. Shipping a piece can take anywhere from a couple of weeks to a couple of months depending on where I am at in my firing schedule and whether I have one of that pattern made already. Many, though not all of my glazes, are food safe and you are invited to use one of my platters for a special feast if the mood strikes you. I ship anywhere in the US for between $25 to $50 depending on your location.